Set down a quality anchor for your living room or den with this essential and versatile entertainment wall. Crafted of 100% solid pine with a multi-step white finish on distressed wood, the Pueblo White Entertainment Wall will fill your room with quality and character. This generously sized wall features a TV stand bridged by two universal pillars that offer up plenty of room for storing remotes and controls, arranging photo frames or showcasing potted succulents. Top off the center console with a flat screen TV and utilize the pillars to store away all your living room essentials or place this versatile wall in your formal dining room and use its amazingly convenient features to store your dishes and dining room essentials. Set down a quality anchor for your living room or den with this essential and versatile entertainment wall. 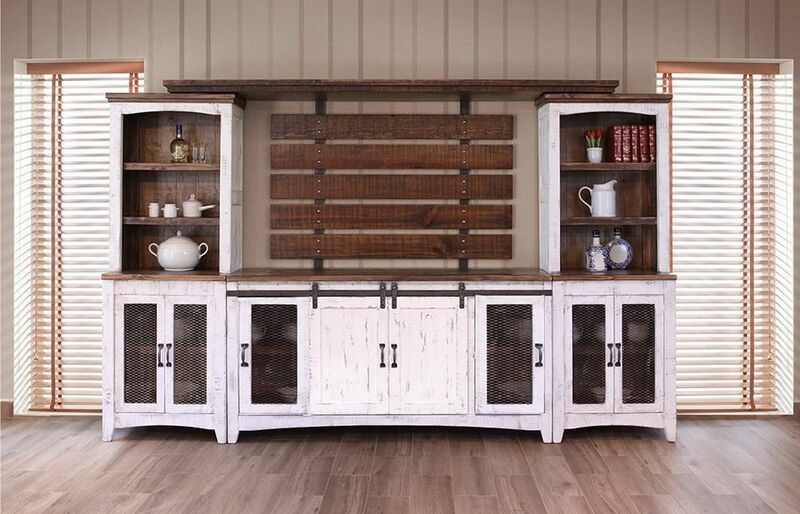 Crafted of 100% solid pine with a multi-step white finish on distressed wood, the Pueblo White Entertainment Wall will fill your room with quality and character.